That's not a car you hear beeping in downtown Boston, it's the sound of young actors performing the endearing musical, "HONK!" Boston Children's Theatre will present the witty musical by George Stiles and Anthony Drew at The Calderwood Pavilion at the Boston Center for the Arts from February 9 - 24. The production will be directed and choreographed by Larry Sousa. 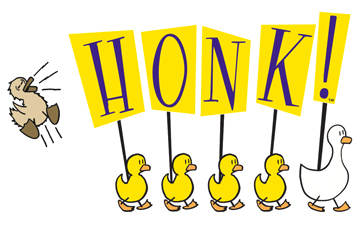 Awarded the prestigious Olivier Award, Britain's equivalent of the Tony, "HONK!" is based on Hans Christian Andersen's The Ugly Duckling. The entertaining family musical tells the tale of a young bird named Ugly whose unusual and awkward appearance triggers prejudice and ridicule among his family and friends. The charming tale follows Ugly as he meets some very interesting characters, discovers his true inner beauty and finds love and acceptance along the way. Larry Sousa's credits include the upcoming Broadway production of "Merry Go Round," as well as many productions with Pasadena Playhouse, Garry Marshall's Falcon Theatre, Goodspeed Musicals, Coconut Grove Playhouse, Utah Musical Theatre and Hangar Theatre among others. An award-winning choreographer, Sousa has worked locally with SpeakEasy Stage Company and Reagle Players and is currently on the faculty at the Boston Conservatory and Bridgewater State University. Working with Sousa is a talented cast of young actors including Brookline resident Alec Shiman; Lexington resident Ally Aquilino-Piscetello; Malden resident Katie Roeder; Newton residents Kenley Buchanan, Carly Kastel and Yarden Yacoby; Peabody resident Karllee Hunt; Revere resident Bradon Barbosa; Rockport resident Tom Rash; Rye, NH, resident Blaine Stevens; Sandwich resident Megan McMahon; Wakefield resident Nina Barresi; Wellesley residents Audrey Hedequist and Alex Hudepohl; and Westborough resident Deirdre Pedersen. For more than 60 years, Boston Children's Theatre has served as one of the region's premier not-for-profit theaters. With a 2012 Best of Boston Award from Boston Magazine for Best Children's Theatre, BCT has a mission to provide access to exceptional theatrical experiences dedicated to fostering the artistic and personal development of diverse youth, with a focus on professional training and the development of new works. For tickets and information, call 617-424-6634, x222 or visit www.bostonchildrenstheatre.org.